Jenny made it for me for my birthday. It is wonderful. Lots of pockets on the inside. 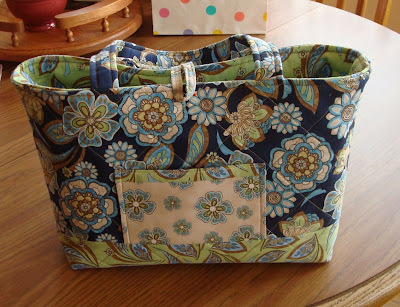 As soon as she gets the button on the outside I am so changing purses. She had 3 of these here yesterday but I forgot to get a picture of them all together. I'll try to get her picture of her girlfriends with their purses. 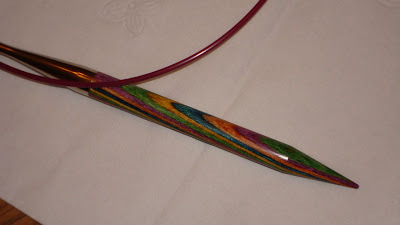 Pat gave me a great set of interchangeable knitting needles. They are really good looking with multicolored wood. 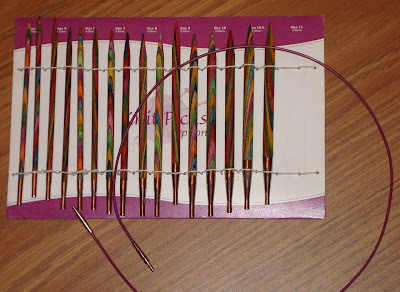 I hope they are smooth and help me knit faster as I have way too many knitting projects going. (not as bad as quilting projects but .... a few) I found a sweater kit I had completely forgotten about. I've decided to go ahead and make it up. The biggest problem to my way of thinking is it has lots of different colored yarns that need to be started and stopped. Why did I pick something so involved! Tomorrow's plans: Finish putting together the purple 4 patch top. Begin a new project: SPRING! -- the pattern that I got in the mail Saturday. I've already started grabbing fabrics for it so I am so ready to go on it. Can I do it in 2 weeks? Probably not unless I have my nose to the grindstone! Happy Quilting All! Bonnie who knows spring is really around the corner. It was 60 degrees today in Northeast Pennsylvania. Happy Birthday!!! I love the bag. Do you know what pattern it is? Like I need another bag pattern but Hey, what the heck!